The Bich-poo breed is commonly known as Poochon. 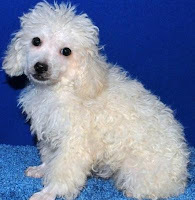 It is not a purebred, but in fact is a mixture of two breeds, Bichon Frise and Poodle. They are also talked of as “designer dogs” and presently they have proved to be good companions. Bichpoo has frizzy, silk like coat of the parent breeds with added intelligence and athletic ability of both the parent breeds.